Aluminum is lighter than steel, making it attractive for improving fuel efficiency in cars, but until now using aluminum in cars and trucks was limited. On Wednesday, Honda announced new developed technologies allowing them to safely weld aluminum and steel together without running into electrical corrosion issues. It will allow Honda to begin using aluminum in car construction, to lower the weight and improve car efficiency. The technology will appear first in the North American version of the all-new Acura RLX, which will go on sale in the United States in March 2013. It will be used in other Honda vehicles in the future. The technological breakthrough required the simultaneous development of several different technologies. 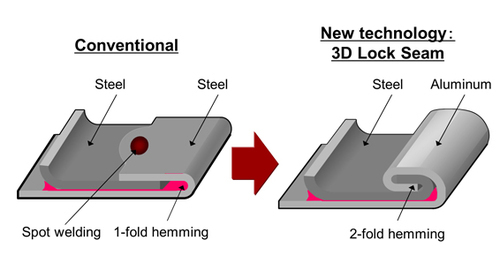 These were: Technology to join dissimilar materials: adoption of "3D Lock Seam" structure, where the steel panel and aluminum panel are layered and hemmed together twice; Technology to prevent electrical corrosion: adoption of highly anticorrosive steel for the inner panel and a new form that assures the complete filling of the gap with adhesive agent; Technology to control thermal deformation: adoption of adhesive agent with low elastic modulus and optimized position of the 3D Lock Seam. The technology eliminates the need for a spot welding process required to join conventional steel door panels. Further the system can be adopted on existing manufacturing lines. Improvement of fuel economy and dynamic performance of the vehicle is enabled by these technologies by reducing door panel weight by approximately 17%. Honda has made other efforts to reduce vehicle weight. In 2012, with the North American version of the all-new 2013 Accord, Honda began mass-production of a front subframe featuring the steel-aluminum hybrid structure made possible by a Friction Stir Welding (FSW) technology.